Manjushri is a bodhisattva or Buddha-aspect who represents wisdom. Usually Manjushri is depicted as a young approximately 16 years old Indian prince, because his wisdom is not just some learned knowledge, but the highest intuitive wisdom. He is sitting on the lotus flower holding aloft a sword in his right hand, symbolising how he is cutting off the darkness of ignorance, duality and limited worldly knowledge of beings. In the left hand Manjushri holds a book of wisdom. This book is Prajña Pāramitā sutra, the sutra of Ultimate (Intuitive) Wisdom, which represents his realization of the ultimate transcendental truth. He can be depicted with a lily in hand, symbolizing renouncing and cessation of disturbing emotions or with jnana mudra. 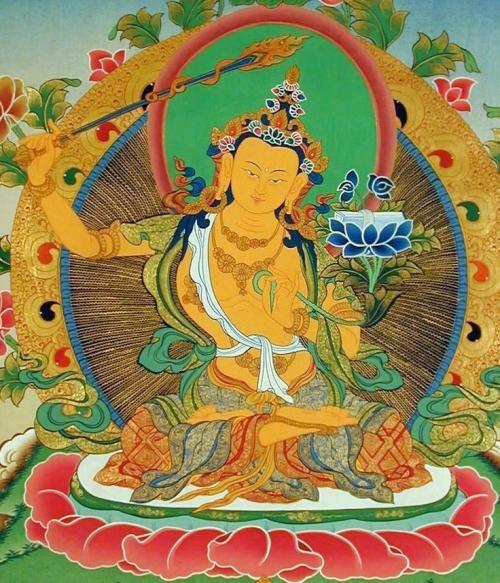 His name Manjushri can be translated as Beautiful Radiance or Gentle Prince. In Sanskrit mañju means: "beautiful, lovely, charming, pleasant, sweet"; while śrī has a range of meanings taking in "light, lustre, radiance; prosperity, welfare, good fortune, success, auspiciousness; high rank, royalty". Śrī is also a common address to realized teachers or saints in Hinduism. He is also known under the name Manjughosha; ghoṣa means "voice", so it is usually translated as Beautiful Voice. Another name of Manjushri is also Vagiśvara or Lord of Speech. Manjushri is considered one of the closest disciples of Buddha Shakyamuni himself. In artworks of Tibetan Buddhism Buddha is often depicted together with Manjushri, who represents the transcendental wisdom of Bodhisattva, at his right hand and Maitreya, the future Buddha, on his left. Manjushri is mentioned in a large amount of Mahayana Buddhist sutras as being present at the Buddha discourses or discussing the wisdom of dharma with Buddha. Many sutras and later philosophical treatises begin with verses of gratitude to Manjushri who is inspiring people to profound knowledge, both worldly and a spiritual knowledge, giving good learning abilities and good memory. The founder of Gelug tradition of Tibetan Buddhism, where Dalai-lama belongs, Je Tsongkhapa is believed to be a human manifestation of Manjushri and the second Buddhist king of Tibet Trisong Detsen similarly. In Buddhist texts Manjushri is first referred to in early Mahayana texts, such as Prajnaparamita sutras. The Lotus Sutra tells Manjushri has his own Pure Land called Vimala, a universe very far in eastern direction. He also figures in the Vimalakīrti Nirdeśa Sūtra in a debate with Vimalakīrti Bodhisattva. Sutras most directly narrating about Manjushri in Vajrayana Buddhism are Mañjuśrīmūlakalpa and Mañjuśrīnāmasaṃgīti. According to scriptures, many aeons ago Manjushri was a king in a Buddha field called Vimala very far away in the eastern direction; he developed a deep compassion to all conditioned beings in Samsara. When he got enlightened, he made great vows to follow the path of Bodhisattva until all beings will be released from sufferings. In Mahayana Buddhism Manjushri is considered one of the four great Bodhisattvas together with Bodhisattva Kṣitigarbha, Bodhisattva Avalokiteśvara, and Bodhisattva Samantabhadra. In Buddhism of China it is believed Manjushri have an earthly abode in the Wutai Shan mountains north-west from the Beijing. In Nepal it is believed that, according to Swayambhu Purana, the Kathmandu Valley was once a lake. And Manjushri saw a lotus flower in the centre of the lake and cut a gorge at Chovar to allow the lake to drain. The place where the lotus flower settled became Swayambhunath Stupa and the valley thus became habitable. Manjushri mantra is chanted for both inner wisdom and worldly knowledge. It is believed it helps in learning, to develop intelligence and good memory. It also brings good insight and intuitive knowledge. For these reasons Manjushri mantra is usually repeated starting learning and students in the lands of Northern Buddhism use it a lot before exams. The syllables of mantra cannot be translated in any language. Besides of the opening syllable om and closing syllable dhīh, the other 5 syllables are considered being the first 5 syllables of a very old Gāndhārī alphabet, sometimes called also Arapacana Alphabet for its first letters. In the old times when not many books were printed, it was used to classify and memorize the Buddha teaching and sutras according to starting letter. a ra pa ca na la da ba ḍa ṣa va ta ya ṣṭa ka sa ma ga stha ja śva dha śa kha kṣa sta jña rta ha bha cha sma hva tsa bha ṭha ṇa pha ska ysa śca ṭa ḍha. Na - is a door to the insight that the names [i.e. nāma] of all conceptual things have vanished; the essential nature behind names cannot be gained or lost. thought, (especially) religious thought , reflection , meditation , devotion , prayer; understanding , intelligence , wisdom. In Vajrayana Buddhism it is said Manjushri is a mother, father and son of all Tathagatas. He is a Mother of all Tathagatas because Manjushri is the essence of all knowledge; he is a Father of all Tathagatas, as he manifests himself in the world in a form of great spiritual teachers and ignites the flame of Bodhichitta (Compassion); Manjushri is a Son of Tathagatas as he takes the form of Bodhisattva.